Founded in 2011, Detroit-based startup UpTo set out on an important mission: Turn your daily calendar into a social network. Sure, social calendaring may not reach out and grab you, but, when the startup launched its iPhone app last March, it seemed worthy of another chance. Event-sharing apps are hardly new (see Facebook, Eventbrite, etc. etc. 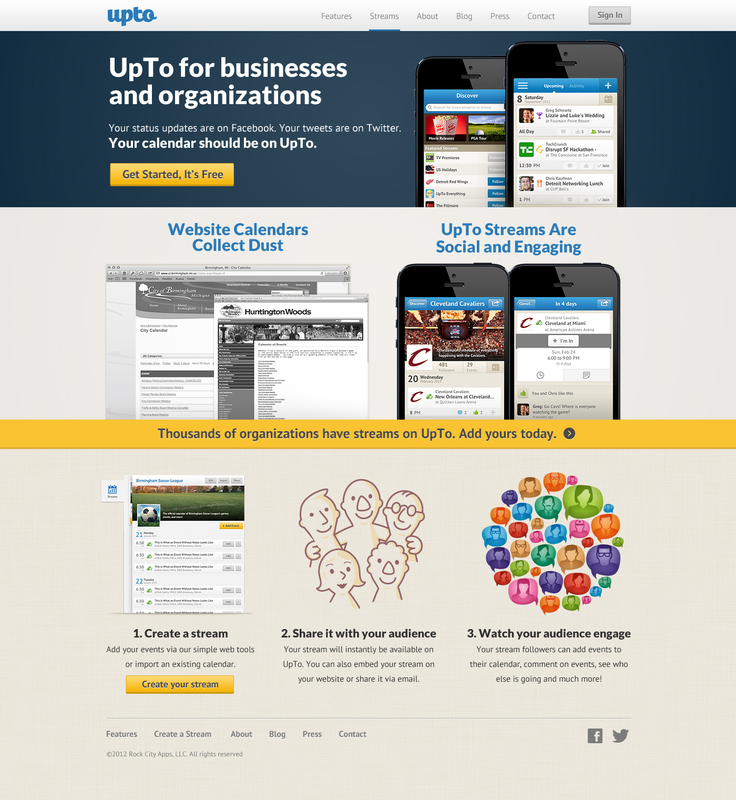 ), but UpTo is taking an approach that many can empathize with when it comes to the social experience around events. While Facebook and Twitter do a bang-up job of cataloguing the recent past and near-realtime, few are trying to create a social experience around the future tense — what’s happening an hour from now, or a week from now. UpTo believes it has identified a massive opportunity in the future tense of social event sharing, so, in first versions, the startup leveraged the iPhone calendar API to bring your personal calendars together (be they GCal, Outlook or Yahoo) and made it easy to share your calendar and events with small groups, like friends and family. The app allows users to add friends from Facebook, their address books and so on, curating them into groups with which they can share an event stream, what conferences they’re headed to next week or which baseball game they’ll be attending with friends, for example. Today, UpTo is announcing that it has expanded beyond its initial event stream platform and will now allow any business or organization to create and publish its own calendar in a live event stream. The idea is to allow local merchants the opportunity to share their upcoming events, deals and specials through UpTo’s mobile-social community — at no cost — which users can then “follow” via the app. Organizations will be able to embed their UpTo streams directly into any website to give them a more dynamic and social alternative to those terrible, static event pages. More than 2,000 UpTo streams have been created to date, covering everything from sports schedules and TV premieres to concert venues and tech events. The app allows users to follow events or organizations based on their location, likes and interests, at which point they can tap “I’m In” to save an event from their stream in their calendar and share it with friends within the app or on Facebook and Twitter. For example, those organizations attending SXSW can create an UpTo stream of the events they’ll be attending, which users can follow to help plan their own schedules, see which parties their friends and co-workers will be attending and so on. These new stream publishing tools for local organizations and businesses are part of the startup’s effort to expand its platform, create more stickiness and go after scale. Like all social networks, UpTo initially had to deal with the problem of, “wait, none of my friends are here, so why should I use this?” By allowing anyone to publish their event calendar and share to social networks, UpTo now has a far greater number of touch points through which they can reach new users (like the embeddable widget, to name another) and is also moving to reduce the friction inherent to onboarding new users. Generally speaking, we prefer to share our schedules, favorite events and so on with our closest friends and family, therefore, UpTo Co-founder and CEO Greg Schwartz says, you don’t need to have 500 friends on the platform to get value out of it. Going forward, UpTo will have to hustle to scale up the amount and variety of the content being published on its platform and will have to work hard to get enough local businesses that are relevant to you to complement, say, events shared from your favorite national sports teams, to give you the incentive to keep coming back. To help them along that path, the startup has raised $1.5 million in a second round of seed funding from Detroit Venture Partners and Ludlow Ventures. The new capital brings UpTo’s total funding to $2.37 million. To provide additional incentive for local businesses, UpTo will also be adding a basic analytics platform (which it expects to launch within the next two weeks), which will give them visibility into how many people are following their stream, who’s commenting, and so on. The analytics dashboard will be free to everyone, although UpTo will be looking to go deeper by offering a premium dashboard — for a fee. Mobile social networks (and really any social network, for that matter) has a tendency to quickly descend into noise and sometimes even chaos. Generally speaking, I really only want to follow five to 10 different companies or events in this way, but could imagine that relatively mellow stream experience being quickly overrun as UpTo adds more businesses to the platform. Schwartz tells us that, in the app’s next version (apparently coming soon), users will be able to unfollow any user and even mute a stream if there’s too much content flowing in, along with being able to “swipe to hide” a particular event. “While we’re trying to go after the long-tail portion of local events,” the co-founder says, “we want all content on UpTo to be relevant to you in some way, and we want to keep the focus narrow, not have it turn into a fire hose.” It’s for that reason, that unlike many local event sharing tools, publications or newswires, users won’t be following “San Francisco Events,” they’ll be following the San Francisco 49ers schedule, or their favorite burger joint. There are a lot of potential stumbling blocks here, but, honestly, who hasn’t thought about how great it would be if there were a better local, mobile event-sharing app? It’s far from perfect and there’s a lot left to be done, but it’s off to a great start. For more, find UpTo at home here.